Dallas, TX. 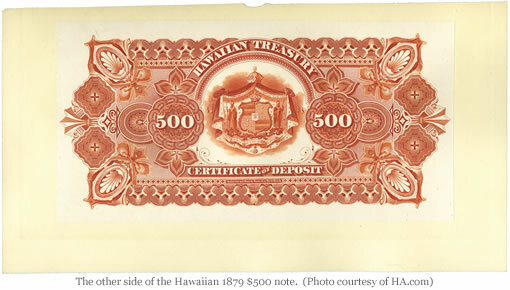 A piece of rare and never-circulated Hawaiian paper money – a $500 note that was to be issued in 1879 – is being offered at auction in Rosemont, Illinois on April 16-18. 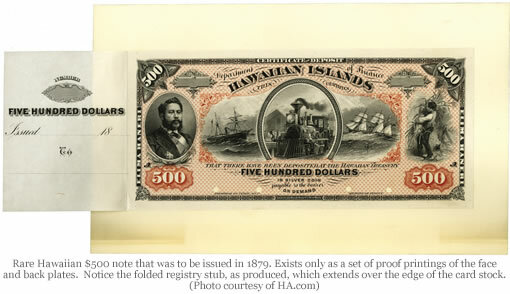 The $500 note, which exists only as a set of proof printings of the face and back plates, is so incredibly rare that it remains unpriced in the standard currency reference guides. The pair of proof printings is one of only two known as well. This pair of proofs is included in the catalog for the Official Auction of the Central States Numismatic Society convention, being held in Rosemont, Illinois on April 17-19. The catalog for the auction is now posted by Heritage Auction Galleries on their HA.com/Currency website.